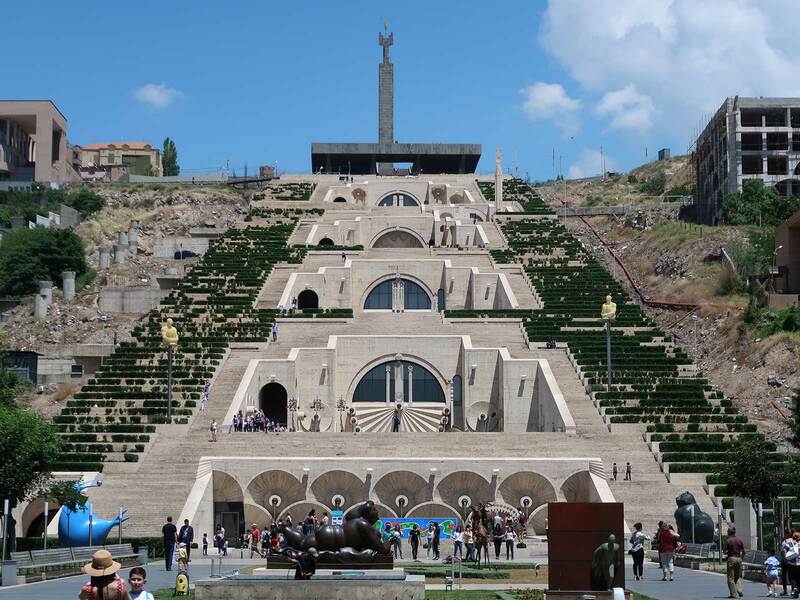 The final day of our trip began with a thirty minute flight from Tbilisi to Yerevan, the capital of Armenia. Our plan was to depart at 7:00am, but the fine people in Georgian Airways moved us to a 6:00am departure just three days before travel, making an unpleasantly early start time even more ridiculous. The change notification came by email, and while the message was received I can't help but wonder how the airline might have handled things if it had been blocked by a spam filter. Our tickets for the twenty minute flight were far from cheap, and given that I'd have expected that someone would have made an effort to communicate the news by phone. Border control formalities after landing were straight forward if a little sluggish, an expected consequence of the Azeri stamps in our passports, but we still made it to our hotel several hours before any of the parks were due to open. In an ideal world we would have gone back to sleep for a while, but our rooms were not ready, so we deposited our bags into lockup and sat down for a leisurely caffeine infusion session in the hotel restaurant. 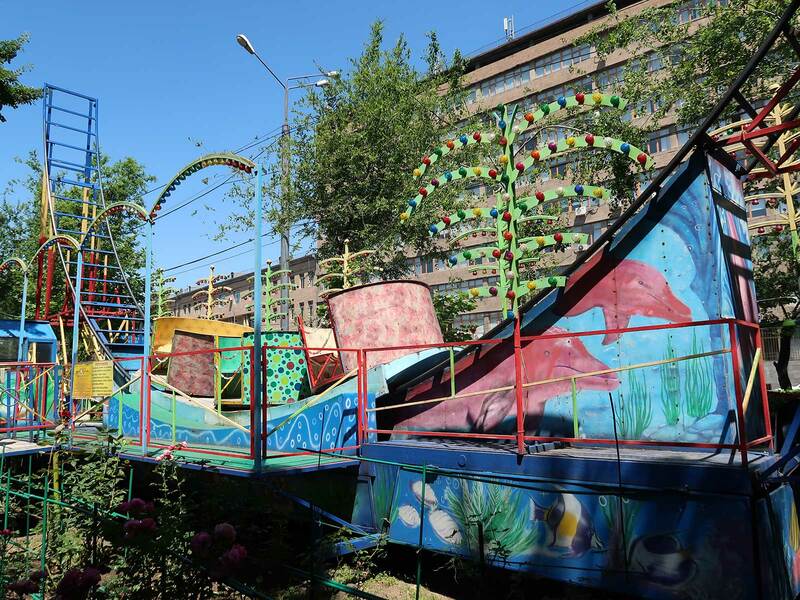 It was around quarter past ten when we arrived at Luna Park Yerevan, and though no rides were moving it was evident that the place was in the process of coming to life; there were plenty of people around, and staff members could be seen completing startup tasks. This work included hosing down the various paths, a nice touch reflecting the fact that the owners take pride in the park presentation. We used the time to explore and take photographs, not least of the Burger Queen restaurant (aimed at coaster enthusiasts perhaps?) at the park entrance. Our wanderings also revealed a previously uncharted shuttle roller coaster on the northern edge of the site. The park has three separate cash booths, each of which apparently sells tickets for a subset of the available rides. Today however the only trick was acquiring a coupon for the right value rather than for specific attractions, as the 500 dram (~€0.88) examples were good on both credits. We acquired our first batch when a booth opened at 10:50am and headed to American Mountain (#2440), a tyre-driven double oval ride from Yamasakutalab with signage containing images of Cheetah Hunt, Great Lego Race, Batman The Ride, and an unidentified yet distinctive Pinfari coaster with a manufacturer logo clearly visible on the front of its bottle green train. The ride has a height differential of around twenty feet, which would ordinarily place it well within family coaster territory. A series of nine tyre drive motors give the train a significant boost however, resulting in a layout that delivered far more than its statistics might suggest. The wheel mechanisms were noisy and the tracking was definitely not what one would call smooth, but for all that the experience was enjoyable enough to ride twice, once in the front and once in car five. The back two cars were out of service today; I'm guessing they can only be used when the rest of the train is full. The other coaster has no English language name, so for ease of description I'm going to call it Half Pipe (#2441) in homage to the Intamin product it looks to have been based on. The ride consists of a three car train of free-spinning cars that roll back and forth on a U-shaped track mounted on the back of a trailer. Today the tyre drive mechanism was pushing the train to within a few inches of the apex on both sides, resulting in a particularly exciting ride experience given the lack of any safety stops. The comfort level was fine, though the nausea factor was very high, and the three minute long programme left me feeling the worse for wear. I decided to recover on a convenient park bench while everyone else went back for a second cycle. Most of the other attractions in the park were aimed at children. The only one that caught our eye was the Labyrint walkthrough, but the space behind the colourful fascia was far too small to contain much. As such we decided to give it a miss in favour of more time at our other destinations. Getting to Haghtanak Park on foot from Yeritasardakan metro station involves climbing the Cascade, a spectacular if somewhat abstruse piece of architecture that has been under construction on and off since the early seventies. Work has been stalled since 2009, but there is still plenty to see, not least a museum of modern art with vitally important exhibits such as a twentieth century metal and green enamel traffic light and an oversized model flower upholstered in a 1970s couch design. The top floor had a large collection of crystals apparently removed from necklaces. I do not understand modern art. Haghtanak Park is a treasure trove of unusual attractions that have been crammed together in one area of a large public garden. Many look to be home spun, not least an unnamed Ferris Wheel with a rotating base, a junior version of the Mondial Shake named Kinder Surprise, and a tall but thin spin ride named Tornado whose support structure probably wouldn't meet TUV standards. Most of our group enjoyed the latter, describing it as an interesting novelty; I was content to keep my feet firmly on the ground. We also spotted the Tennessee Tentacles from American Adventure with its original warning about left luggage still on display in the control box window. Cobra (#2442) has exactly the same layout as the Yamasakutalab ride at Luna Park Yerevan, but the appearance of the track and support structure is quite different, raising some doubts over its provenance. The intensity level of the experience was several notches higher than the other model, resulting in a thrilling ride that delivered a blow to exactly the same spot on my right knee on all three laps (and before anyone asks, there was no room for me to reposition it). Each track tie was painted in a different colour, a nice touch albeit one largely invisible from the midway as the surrounding area was overgrown. There was a second coaster-like ride at the back of the park that we found listed as an undefined attraction on coaster-count.com. Sleigh Ride features a car with a heavy duty power cable and commutator that traverses a U-shaped track with an electrical power rail at its base. The ride was not working today, and the general condition of the hardware suggested that it was likely out of service permanently. This was in many ways a relief; though not a countable credit I'd very likely have ridden anyway to judge for myself even at the cost of an upset stomach, proving that I'm not always very smart when amusement rides are involved. 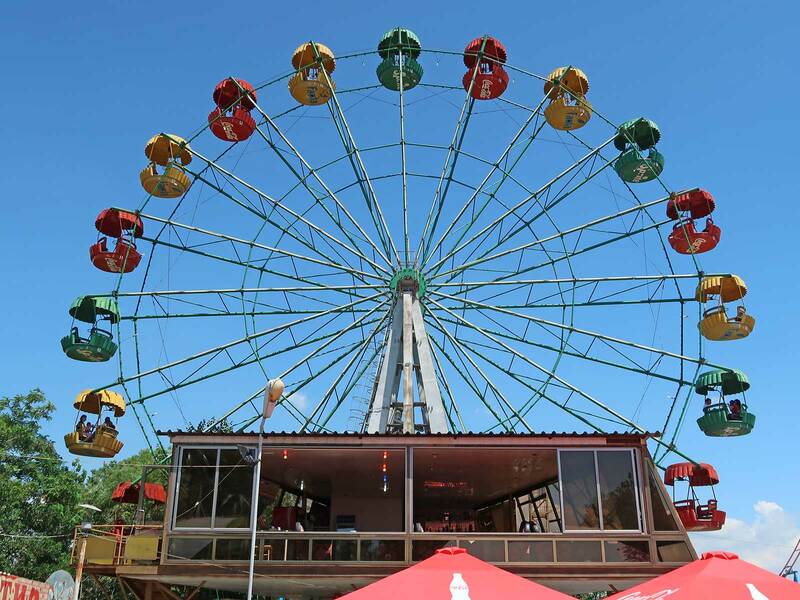 The walkthrough Haunted House was also closed today, leaving us just one other target with the Giant Wheel, an Analog model identical to the one we saw last year in Pripyat. The cars were wrapped with branding for Sprite, Fanta, and Coke that promoted the product without being obnoxiously garish. The view from the heights allowed us to definitively confirm that there was no other roller coaster on site, and with that done we made our way towards the exit. We decided it was easiest to walk the whole way to Mankanan Erkatughi from Haghtanak Park, as taking the metro one stop would have involved backtracking. Those doing Armenian coasters in a different order have the option of using Marshal Baghramyan station, and indeed we used that to get back to our hotel after our visit. The park is located in a valley quite a long way below surrounding streets. Despite that the sound of thumping music is clearly audible from some distance away, making me feel very sorry for the neighbours; a steady bass beat during evenings and weekends cannot possibly be fun. Our walk down the access road was interrupted by a convoy of cars with horns blaring that we determined to be a wedding party; I can only assume that the happy couple were in fact Armenian Coaster Enthusiasts (ACErs?) tying the proverbial knot on Family Coaster (#2443).